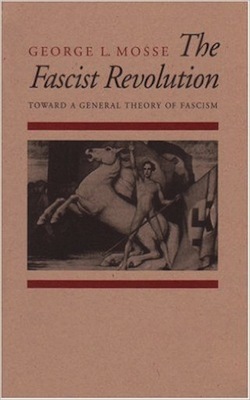 The Fascist Revolution: Toward a Theory of General Fascism, is a collection of essays written over a 35-year period and published in 1999 (the year of author George L. Mosse’s death). It offers not a comprehensive vision of fascist ideology, but a succession of views, each through a different lens: aesthetics, fascism, racism, nationalism, intellectualism, and so on. The resulting analytical kaleidoscope is particularly thought provoking to read against the current upheaval in American politics, especially the rage that has fed the Tea Party and Bundy Ranch supporters and is now buoying up the presidential campaign of populist billionaire Donald Trump. Today’s political dialogue shares some obvious attributes with Italian Fascism and German National Socialism, such as the celebration of national identity and an embrace of violence, sacrifice, and brutality. The rhetoric of this year’s Republican primary debates has resounded with such themes. But Mosse identifies two other fundamental tenets of fascism—irrationality and revolutionary activism—that are commonly overlooked, and which have suggestive echoes in the current zeitgeist. 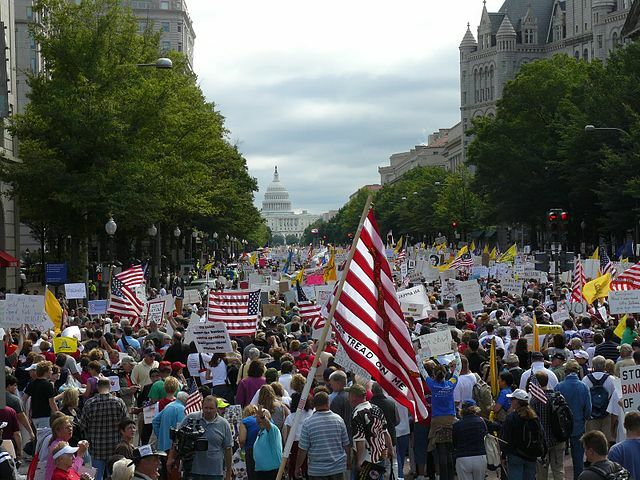 Tea Party protesters walk towards the United States Capitol during the Taxpayer March on Washington, September 12, 2009. Via Wikipedia. Fascism was inherently irrational, a rejection of Enlightenment ideals, and profoundly anti-intellectual. This irrationality (which Mosse connects, in the case of German National Socialism, to Europe’s late-nineteenth-century embrace of Romanticism), was long ignored by historians as “too outré to be taken seriously.” Yet as Mosse shows, irrationality served an important function in the workings of the party and the ideology. It provided a means for followers to resolve “a very real dilemma: after 1918 the society in which they lived did not seem to function well or even to function at all.” Fascism made an idealist promise to somehow transcend the social instability of the time. The details were purposely left vague, conveniently discouraging adherents from looking too closely at the movement’s methods. It is intriguing to consider fascism’s use of irrationality in light of modern calls to “Take back America” by processes that range from the improbable (repealing a broadly popular national healthcare policy) to the ludicrous (forcing Mexico to pay for a border wall). A sizeable percentage of America’s electorate, aware that today’s globalized economy does not function well—at least not for them—seems quite willing to suspend rationality and believe such promises. Fortunately, there is scant evidence that today’s promise-makers have either the means or the aptitude to make anything more than symbolic gestures toward fulfilling their promises. 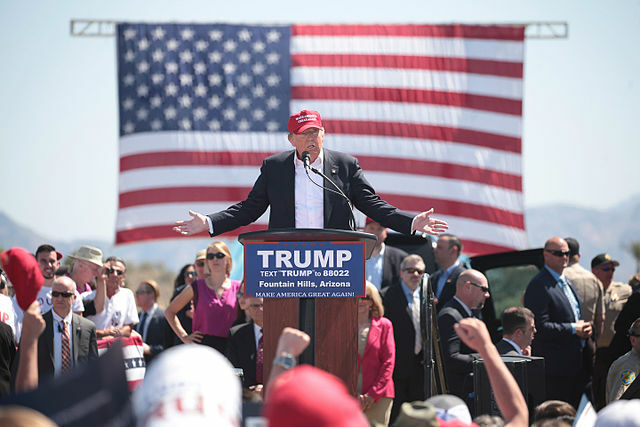 Trump speaks at an Arizona rally in March 2016. Via wikipedia. Fascism was also, Mosse notes, explicitly revolutionary; an activist doctrine that focused its energy on destroying the existing order and replacing it with something new (though in Germany’s case, the future would be informed by the past). In this way, fascism stood in opposition to conservatism, an arrangement that also resonates strongly with today’s headlines. Witness the consternation of today’s GOP officials, who have lost control of their nomination process and seem to no longer even understand the anger of their own base. But while twentieth-century fascists made devastating use of the revolutionary energy they generated, modern conservative politicians appear caught off guard by voters’ revolutionary zeal, their willingness to destroy institutions in order to bring about the change they perceive as vital to national survival. It is somehow comforting to realize that our politicians are markedly less competent than the fascists in this regard. And there are other important differences between our era and that, which gave rise to European fascism. Though economic uncertainty is again a factor in our politics, the intense anxiety over “respectability” Mosse identifies as a breeding ground for fascism’s moral code is largely absent today; we are, perhaps, simply more relaxed now. The mistrust of cultural pluralism undergirding today’s pro-nationalist arguments is partly a response to demographic trends that make it all but impossible for those concerns to become mainstream. Our understanding of “nation” has shifted, becoming more diverse. And while the fascist obsession with sexuality, and control of it, has its echoes now, recent attempts to criminalize abortion, birth control, and gender non-conformity have failed at the national level and are likely to be rolled back in the states where they have found purchase. Supporters of such policies are part of a smaller, and shrinking, population. Still, there are enough eerie similarities in Mosse’s essays to make them rewarding reading for anyone curious about the growth and spread of destructive ideologies—including those presently in circulation.